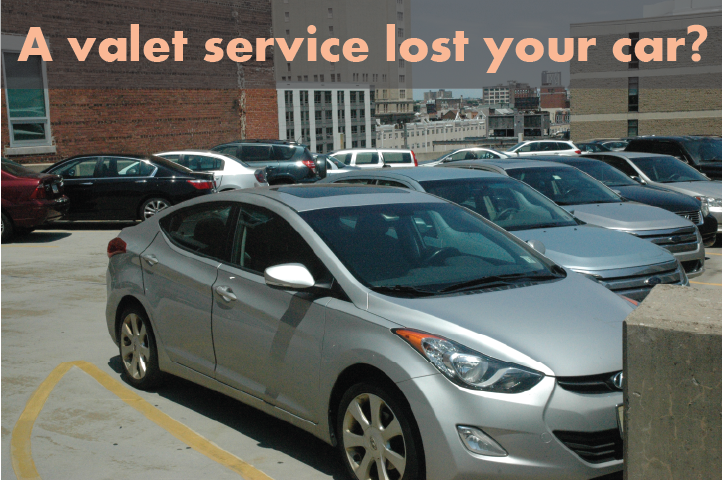 What to do when a valet parking service says they lost your car. First, don't panic. Let's start-off by insisting on an immediate refund of all parking fees paid, because you should not be paying them to inconvenience you. The most likely thing that happened is the valet who parked your car probably forgot to write the location coordinates of your car on the ticket. Or the location coordinates are incorrect. Brand new valets make dumb mistakes like this all the time. Ask to see your key. Is it the right key? Is it yours? If yes, ask who parked your car. They might not have taken this simple step to resolve the matter. Whoever parked it should have an idea where it is. Could the car have already been brought up and is just sitting on the driveway somewhere? Sometimes this is the case. Let's take a good look and make sure it's not already here. Tell them to get a car. They are going to drive you throughout their parking facility until you see your car. As you are being driven around, try pressing the car fob's alarm button repeatedly until you find it..
Or, if you know the key fob works and you're not interested in riding with a valet, tell them you're in a hurry and you want to see all hands on deck attacking this. Explain exactly what kind of car you have and what color it is, so everybody is clear about what they are looking for. You want to see hustle, not casual strolls to the parking facility. You want to see running! Ideally, you will be explaining what you want to see to the top person onsite who is in charge of the valet staff. If they are not running their asses off and treating this with immediate URGENCY, then you should seek to have an immediate discussion with the top manager of the venue, and get that person to light a fire under their asses. This is also an opportune moment to explain that you want compensation for the aggravation and lost time inflicted upon you (to the venue manager). One other possibility could be that your car battery is dead and they are relying on the key fob to show where the car is. If 10 more minutes go by and you still don't have your car, then tell the valet manager to get in the garage and find your car. The clock is ticking and you will be calling the police very shortly if you don't get your car quickly. If the valet manager is absent, tell the valet in charge to get him/her on the phone. Then explain to that manager your car is missing and you want him/her to immediately get down there to resolve it. Also say that you want the phone number to his/her district manager (or company owner) right now. Sometimes all it take is a new set of eyes to take a fresh look, and the car gets found. The longer it takes to get your car back, the greater the concessions you should be asking for. The least likely scenario is that your car was stolen. It happens. But cars merely being misplaced and temporarily lost is the most likely situation. It's possible that the valets are all high and your car is right in front of them. Could they have parked it on the street? If this is the case, the city might have towed it. Yes, this does happen with valet parking companies. Your car might be sitting in an impound lot. Well, if the manager can't find it, and if it wasn't parked on the street and possibly towed by the local parking authority, then now it is beginning to look like the car has been stolen. Do you have LoJack or OnStar or a service like that? If so, get in touch with them and tell them your situation. They might be able to locate the car for you. If that option is fruitless or isn't available, then consult with the manager about what he/she proposes to do. I would suggest that it is probably time to involve the police. You need to be made whole. This starts with the valet company providing you with a free rental car that is comparable in style and quality to yours. If you have a BMW M5, then you expect your rental to be an M5, or better, not a Chrysler 200. Quickly journalize everything said to you and all promises made, word for word. Take a strong stance. Add your own demands. Unlimited rental car use with insurance provided by the valet company. Unlimited free parking for a year at any parking facility controlled by the valet company. Full-replacement cost of your vehicle provided by them within 30 days. X number of free meals for two at the venue's best restaurant. X number of free 2, 3, or 4 day stays at this hotel in the future. If the missing car is recovered, they agree to promptly pay compensation at the rate of $3 per extra mile driven, plus cover the cost of a full interior and exterior detail by a detail shop of your choosing; they will fully pay for any repairs needed to the car at the repair shops of your choice, and they will compensate you for the full value of missing items, which include... (write it all down). Tell the manager to sign it. Your wish will probably be a quick resolution with a suitable replacement car. Their aim will be to get you to claim the car stolen using your insurance, not their's. It is likely there will be a long delay with getting all of this taken care of. As they stall, the valet company will hold out hope that your car suddenly turns up. In these situations, the recovered car has extra mileage on the odometer, contents are missing, plus there is new damage. You are going to have to fight to get adequate compensation. So raise the bar by writing out your terms as soon as it is clear that your car is gone.